At 9.99mm (0.39 inches), Pantech's new slim phone is the skinniest slide-phone currently on the market, beating Samsung by 3mm. And, in a cellphone first, it's all down to Magnetic Levitation, the same technology that is used by Japan's Bullet Trains some high speed trains. 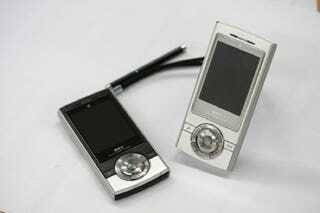 The phone also sports a 1.3-megapixel camera, MP3 player and DMP (terrestrial digital multimedia broadcasting). Using magnetic forces, Maglev enables one object to be suspended above another object and it is this that makes the phone slide. It's out next month in Korea and costs an obese $527, but expect to see it over here if it does well over there.